My review today is of a dual processor motherboard the ACorp 6A815EPD. It’s an older type using Pentium 3 Processors rather than Xeon or AMD MP technology. The reason for me using this motherboard was the fact that Computer Geeks was selling these boards for $29.95 each. They must have had an inventory glut or something. But I’m not complaining the price was right! 500-1000MHz Pentium III processor with 100/133 Front Side Bus. VIA Cyrix III Processor with 100/133MHz Front Side Bus. The board itself is laid out quite well. There is very good clearance around the sockets, the RAM slots are far enough away so as not to interfere with anything and generally everything is positioned pretty well. There are only 5 PCI slots, but for a file server its plenty. There is not much in the way of onboard components so 6 slots would have been nice. As you can see from the picture below there are 4 IDE channels on the right side of the board. The 1st two are the regular IDE channels and the next two are the RAID channels. 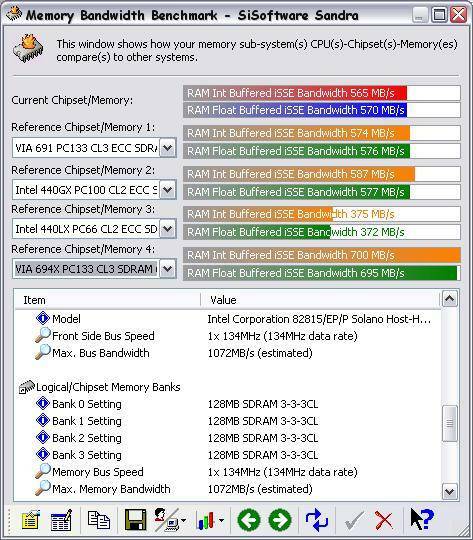 There are 3 memory slots, unfortunately these will only support up to 512 MB’s of PC133 RAM. This is a limitation of the i815 chipset. This is perhaps the worst part about this board. I would love to be able to use more memory. For a simple file server that I’m using it for it will be adequate, but for a workstation it would be lacking in some areas. Particularly if you were wanting to use it for intensive graphics work. As a server it would be totally inadequate. Here’s a list of what components I will incorporate into this system. Miscellaneous stuff Arctic Silver 3, Silver rounded cables, etc. I ran a few benchmarks to see how well this system performed compared to others and it seemed to do quite well. While it’s no Dual Xeon system it was considerably cheaper. 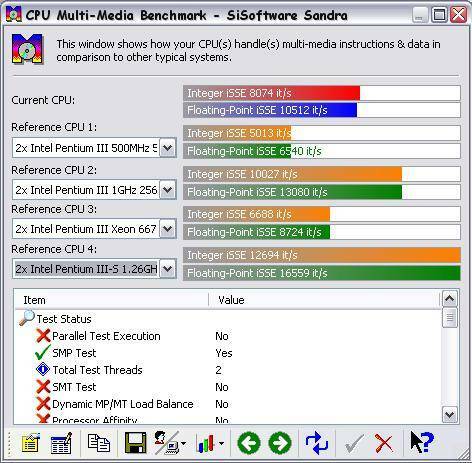 I used SiSoft Sandra for the testing. I also tested this system against some others using Photoshop to see if the dual processors provided any advantage in an application that could utilize them. In rendering a 3D object (a 29.1 MB file) I timed the process and recorded the CPU usage. All settings were set to highest quality. As you can see the results are somewhat skewed towards raw processor power. The most surprising was the AMD rig. It is my gaming rig and has very little installed on it so this could have something to do with the result. The only advantage I saw with the dual processors was that the CPU usage was lower and allowed you to do other things while it was working. (I did not do this during the test) So in reality the dual processors are more useful as you can keep working while doing CPU intensive things that would cause a single processor system to freeze up. This is very handy for multi-tasking. Unfortunately (or fortunately depending on how you look at it) I don’t have a comparable slow system to compare with. For my purposes this was a very good investment. I got a cheap, reliable server out of the deal. Most of the parts I already had and were just gathering dust, so the investment was minimal. I pretty much put the whole system together for under $1000.00. Sure it doesn’t have hyper threading like Dual Xeon’s do but it also didn’t cost $1000’s of dollars either. I have had this system up and running for about 2 months now. I have yet to see one single problem. It’s reasonably fast, stable and very reliable. One of the main things I like about this system is I can do multiple tasks without the lag I sometimes see in single processor systems. For instance; when I am un-raring files. On my 1.8a P-4 rig (@2.4) I can’t even use messenger services as the processor is at 100% use all the time. 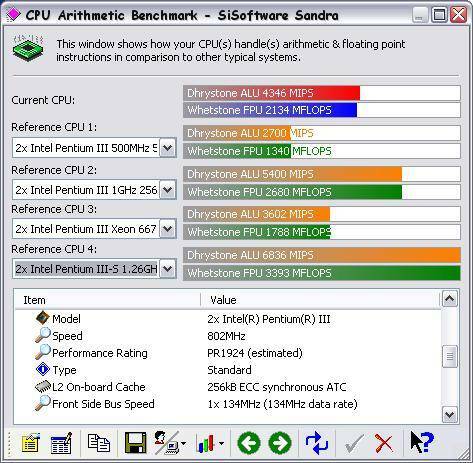 With the Acorp system I can do other things while un-raring files and the processor usage is only between 50 and 60%. Price: at $29.95 this was a real bargain. Did I mention the price! !